Stephen Peduto wanted to learn how to play the violin and needed a thoughtful pitch for the Career Fair. Then he became part of a marriage proposal. Before the junior bioengineering major walked out the door for the Career Fair last month, a project he'd worked on in his spare time caught his eye. 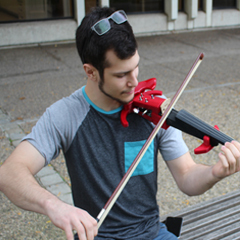 So, he grabbed it—"it" being a 3D printed acoustic violin he produced—and included it in his pitch to employers. "I do all kinds of random stuff outside of class to stay motivated. You need a beam of sunlight every once-in-a-while," he said. "And most of the employers I talked to have been interested in that. They see that someone can take the things they've learned and distill it down into real work." Though many of the employers were civil or mechanical engineering-focused, many wanted to talk about it. Some thought it was a cross bow. But they all noticed it. "It riled people up and definitely was a conversation starter," Peduto said. It's not the first creative extracurricular project Peduto has crafted. Earlier this year, a fellow Redditor saw an example of Stephen's work—a puzzle box he developed in high school—and asked if Stephen could create something similar that the Redditor could use to propose to his then-girlfriend. "I had to design with some extra space for the ring. Also, I made sure she could have been within 17 degrees of the combination in either direction and still got it open," he said. "I didn't want to make it too precise and ruin his moment, you know?" After starting the two-month project over spring break, and working through some near-disasters, Peduto 3D printed a replica of the ring and sent the puzzle box off to his customer. If you're wondering, she said yes. As for Peduto, he's since updated the violin to play electric, as well as acoustic. But he's still working on that original goal: playing it. "I built it to learn how to play, but I didn't bring the bow (to Career Fair). There was no circumstance where I wanted to be playing it there," he laughed. "Now I need to bring it to someone who can actually play."